Family dentistry is focused on providing complete, comprehensive oral care for people of all ages, from kids to seniors. 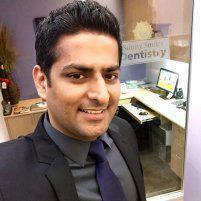 As a leading family dentist in Gilroy, California, Dr. Sandaldeep Singh has significant experience in treating a wide array of dental issues and in providing preventive care solutions. He’s skilled in identifying emerging problems in their earliest stages to lessen the health risk and the expense. To schedule your checkup and exam, call Sunny Smiles Dentistry today, or use their online system to schedule your visit with the push of a button. Family dentistry focuses on the very different dental needs of kids and adults by using diagnostic and treatment techniques designed to address the needs of each. Dr. Singh has extensive experience providing treatment for patients of all ages, from preventive care to restorations to cosmetic treatments. You can feel confident that you and every member of your family will receive the most appropriate and effective care to maintain healthier teeth, gums, and beautiful smiles. What kinds of services does a family dentist provide? What happens during a routine cleaning and checkup? Routine office visits and cleanings begin with a review of any symptoms you may be experiencing and a quick visual exam of your teeth and gums. Dr. Singh or the hygienist will use instruments and mild abrasives to carefully clean the surfaces of each tooth, including the spaces between the teeth. Once the cleaning is complete, you might have X-rays or fluoride treatments and Dr. Singh will perform an in-depth exam of your teeth to look for signs of decay or gum disease. At the end of your appointment, he reviews the results of your exam and his recommendations for treatment, as well as providing guidance on how you can improve your oral hygiene routine at home. How often should I have a professional dental cleaning? The American Dental Association recommends a professional cleaning every six months for kids and adults, including kids with baby teeth and adults with full upper and lower dentures. Having routine cleanings and checkups is very important for preventing gum disease and cavities, screening for oral cancers, and identifying other problems in their early stages so they can be treated and corrected. X-rays provide important information about the health of your teeth and your jaw bone. While a routine exam is very important for identifying many oral health issues, the techniques used during your exam can’t reveal problems under the gums. Regular X-rays can identify these problems in their early stages before they have a chance to cause serious damage leading to infections and tooth loss.